Well, when I'm in a bad mood, it's clearly Avada Kedavra. No, no—just kidding! :D In all seriousness, Accio needs to be a real spell. You don't know how many times I've misplaced something (phone, keys, glasses, wallet, jewelry, etc.) and wished that I could just use Accio to find it. There are also the times when I'm lazy and the ability to summon an object would come in super handy. I could see myself using Accio all the time, really; it certainly proved useful to Harry for the first task of the Triwizard Tournament! Yes!! So many times yes! This would probably be THE most useful spell ever. Though I hate to think how many times I'd get hit in the face by my own hand - I'm always looking for my phone when it's right in my hand! Haha! I'm ashamed to admit this, but on more than one occasion I've had to call my mobile phone from another line because that was the only way to find it. And I've actually said "Accio" out loud while trying to find it a few times, lol! I've mentally used Avada Kedavra on people; is that bad? 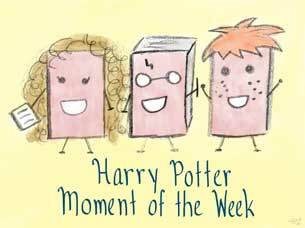 XD Sometimes when I'm sitting upstairs reading, I wish I could Accio a snack from the fridge downstairs; that is bad, isn't it?! I would use this spell so much. Sometimes when I lose something I think of this spell and yell it out!!! I do the same thing! If only that worked the same way it does in the books! Zane says Accio for things that he loses too hoping it will just appear. I love it! It would be so helpful. Especially when you're really sick and don't feel like moving. Accio tissues! Yep, I would use it all the time :D Jaclyn @ JC's Book Haven. Haha! Lately my allergies have me constantly wishing that I could Accio tissues!